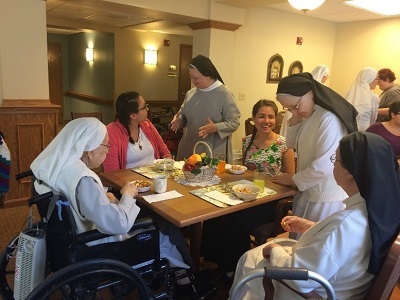 It is always great to have young ladies visit the monastery as they search for God’s plan for their own lives. For me, these events are particularly fulfilling because they remind of my particular mission of bringing others to encounter Christ, of helping others find their way to living out fully what God has planned for them. As I engage with young people from all over the United States, I am reminded of exactly why I am a Missionary. 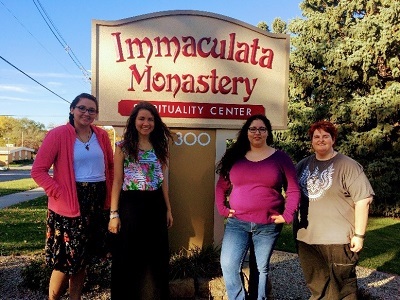 In October, we had 5 young ladies spending the weekend with us as part of their discernment journey. They came in Friday (one already Thursday) and stayed with us until Sunday afternoon. Most of these are students, so that is a commitment to them as some miss class to travel Friday coming to these events. I had encountered all of these ladies from my various vocation events, so it was a real joy to host them, and have them spend time with the community. They joined the community for prayer, meals, recreation, as well as listen to various Sisters talk about various elements of our way of life. They particularly enjoyed having coffee in the infirmary area will all our elderly Sisters. As most of these young ladies are still college students, we continue to pray for their discernment. May the Lord continue to show them His will and lead them to where He wants them to serve Him.